Her head hurt. There was a sound grating against her mind, a music-less rasp like the rustling of paper. Somebody had taken a laugh, crumpled it into a great, crackly ball, and stuffed her skull with it. Seven days, it laughed. Seven days. When I opened Frances Hardinge's new book, Cuckoo Song and read those words, I knew I was going to enjoy it. After a few more pages, I found myself closing the book, and hugging it close to my chest. I wanted to hold on to that moment - the fizz and delight of knowing this story was going to get under my skin and make me live it, and for as long as I stopped, and refused to read any more, it would all still be there, waiting for me, stretching out ahead. It's the best feeling - and Cuckoo Song didn't disappoint. It's a glorious, imaginative, delicately spooky book, with characters that stay with you afterwards, and some fine twists and turns of plot. One of the plot twists is quite a big one, and it's hard to review the book without giving it away, but I'll do my best. In fact, anyone even vaguely familiar with fairy tales will probably guess it quite early on (I did) but it doesn't spoil the story. There's still plenty of tension in working out exactly how this twist will play out and what will happen when it's discovered. And tension is one of the things that Hardinge does incredibly well in this book - from the first page, and that ominous 'seven days', the reader knows this is a story that has a ticking clock in the background. Triss also has to contend with a fiercely antagonistic younger sister, Pen, jealous of the special attention the invalid Triss gets from their parents, and also apparently terrified of her older sister. But it's Pen who holds the key to what has happened, and it's only when the two sisters join forces that they begin to have a glimmer of a chance against the mysterious Architect who's behind it all. The bond between the two sisters is at the heart of the story, and Hardinge skilfully shows the mix of jealousy, rivalry, loyalty, love and exasperation that animates their relationship. The book is set in the 1920s, in an imaginary industrial town in, at a guess, the midlands, and the fairy-tale elements gain some of their power from the contrast with this very down-to-earth setting of trams, telephones and motorcars. It's the beginning of the modern era, but lurking in the shadows of the remaining gas-lamps, and in the cracks and wastelands of industrial development, are the Besiders, Hardinge's version of the fairies. The Architect is the most powerful but there are others, too - the Shrike, with his strange bird-like face, and others, whose shadows flit across the corner of your vision - and they want something from the humans, something they are prepared to kill for. All the instruments plunged in at once, as if they'd been holding a party and somebody had opened a door on them. Where was the tune? It was in there somewhere, but the instruments fought over it, tossed it between them, dropped it and trod on it, did something else, then picked it up again and flung it in the air just when you were least expecting it. Later, Triss watches a party of young men and women dancing to some of this untamed music in an old warehouse down near the river. The windows, looking out over the water, make her feel as if she's on a boat. Nobody was steering the boat, everybody was dancing, and nobody danced more wildly than Violet. There was something desperate about it, as if dancing would stop the boat sinking. There was something fierce about it, as if she wanted to drive her foot through the hull and sink the boat faster. Violet, the ex-fiancee of Triss and Pen's dead brother Sebastian, is a motorbike-riding, cigarette-smoking, thoroughly fast young woman. In her acknowledgements, Hardinge suggests that the inspiration for Violet was her own grandmother, who 'threw her home village into confusion when she returned from London on a motorbike'. Wherever she came from, she's another treat in a book full of them. In a recent blog post on ABBA, I tried to come up with a set of criteria that got at the heart of what a really good children's book should be. 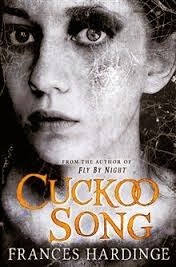 Cuckoo Song, for me, fulfils all those criteria with gusto, humour, wit and pure panache. C.J. Busby writes funny fantasy adventures for age 7-11. 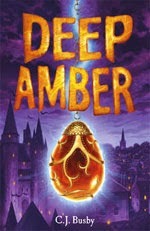 Her latest book, DEEP AMBER, was published in March 2014 by Templar and has been shortlisted for the Stockton Book Award.